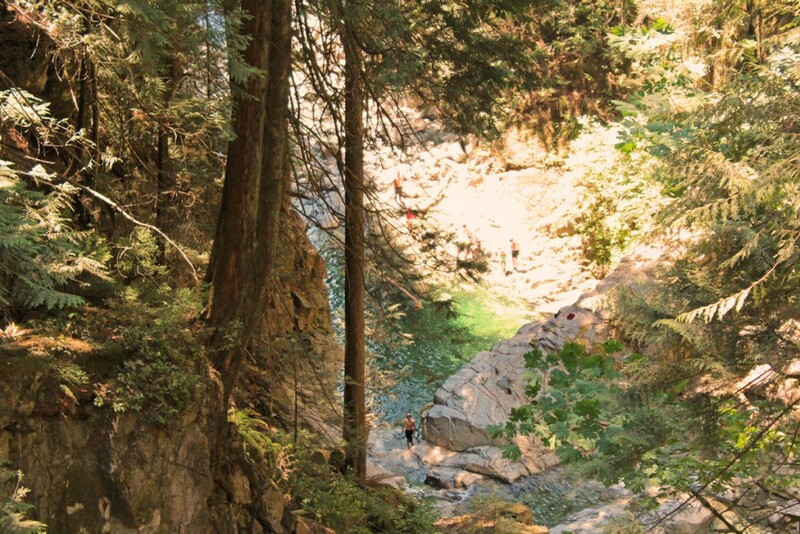 There are a lot of scenic wilderness parks in British Columbia and many within driving distance of Vancouver. 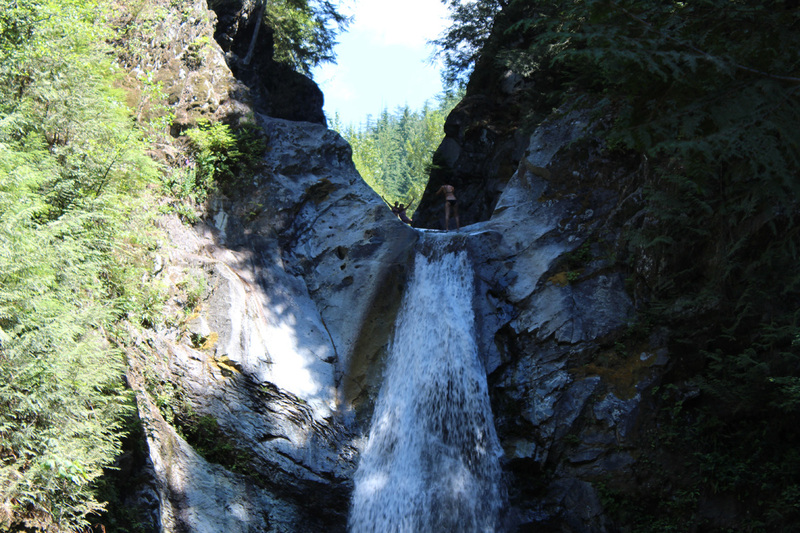 One that is well known to locals but not very well known to Vancouverites is Cascade Falls Regional Park near the City of Mission. 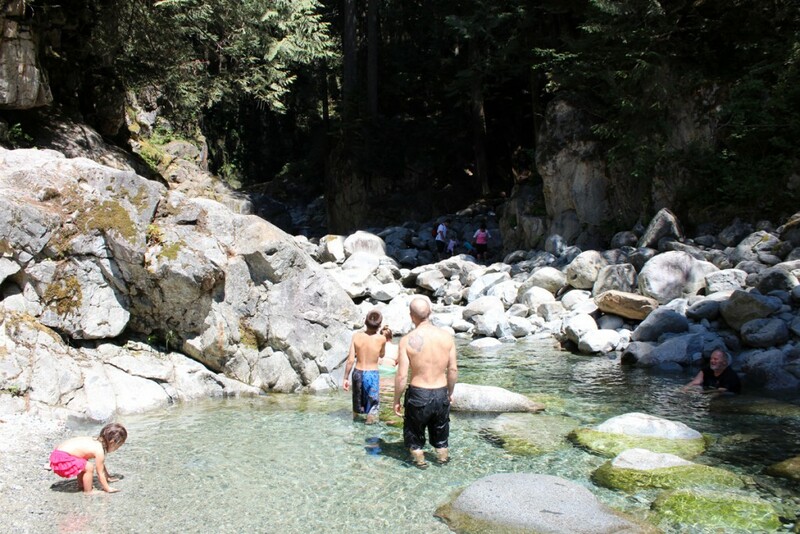 It’s a two hour drive from Vancouver, but just 25 minutes from Mission. Best way to get there is to take Highway # 1 to the Abbotsford-Sumas exit. Take Highway # 11 to Mission and turn right onto Highway # 7. Shortly after Hatzic Lake, turn left onto Sylvester Road. This is winding road that takes you up the mountain. After 14.6 kilometres, turn right onto Ridgeview Road for a kilometre to the parking lot. 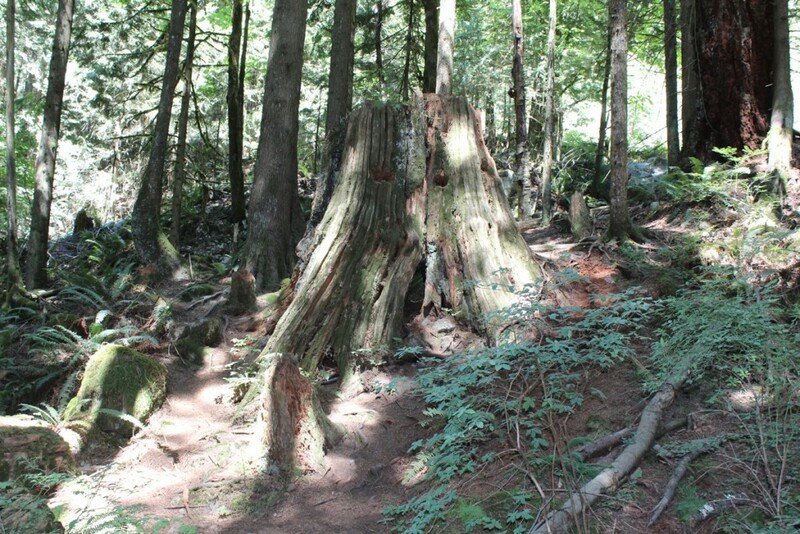 Cascade Falls Regional Park is a 22 hectare park surrounding Cascade Creek. 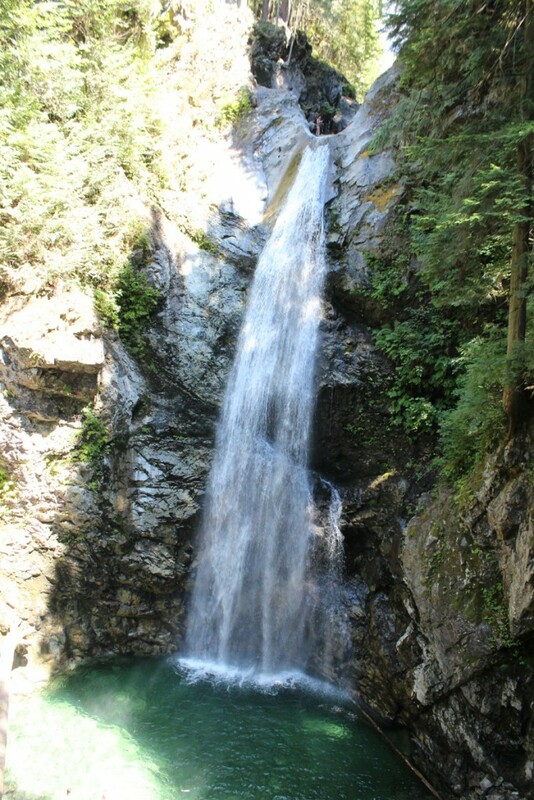 Its main attraction, of course, is Cascade Falls. 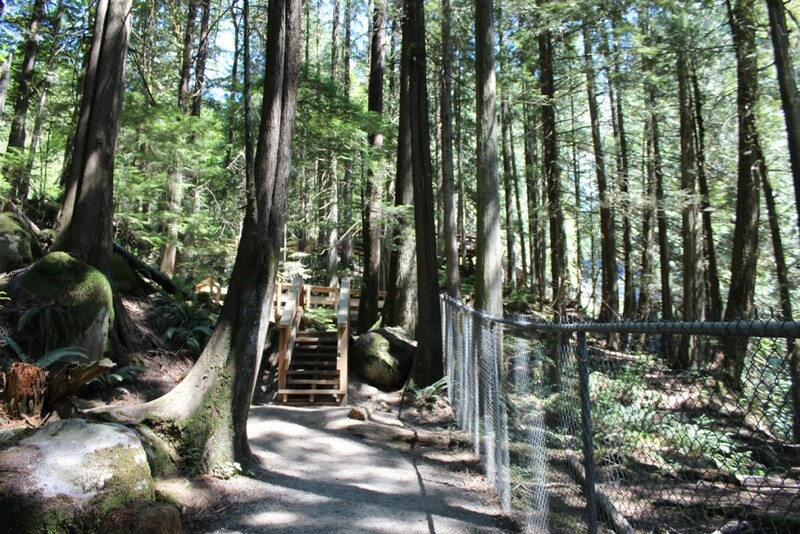 You’ll find it up a winding trail, a fifteen minute hike that takes you to a viewing platform. The falls itself is spectacular. 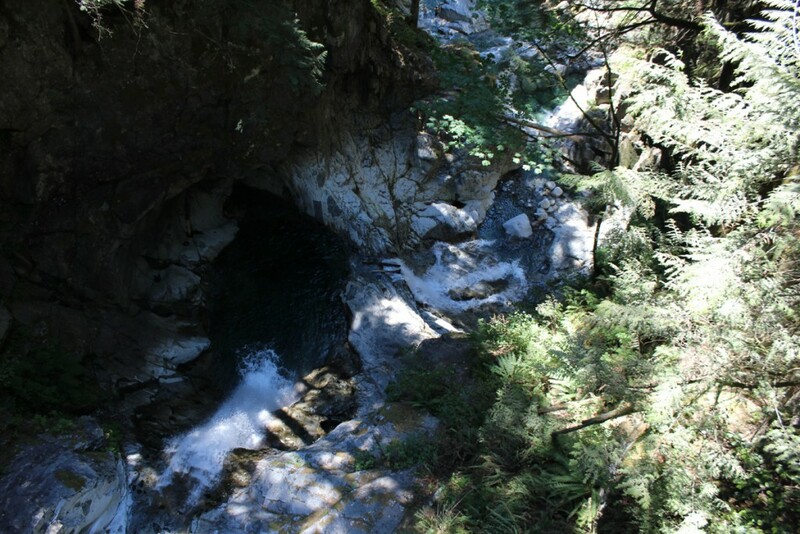 A 30 metre drop carries the swift current to a deep emerald pool below. We were there in July but the amount of water running over the falls is heavier in the Spring. Although the water is cold, there were a few people in swimsuits gathered around the lower pool, cooling their feet and enjoying the view. 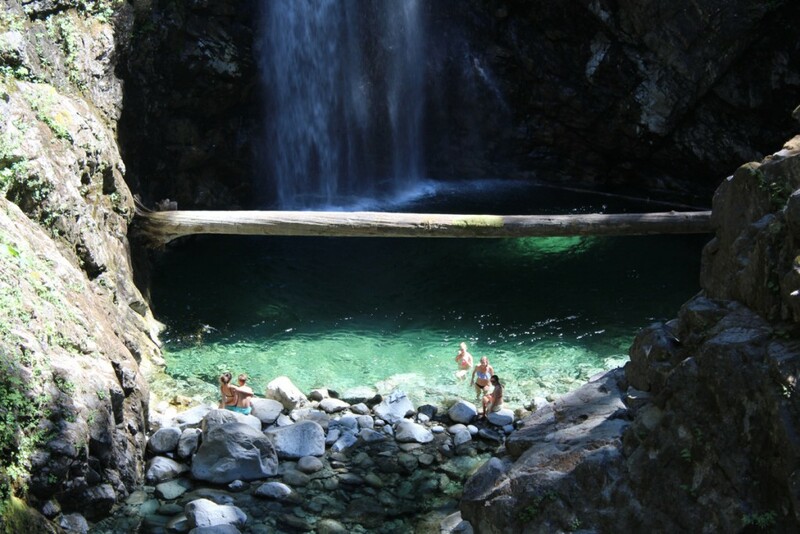 Locals enjoying the scenic beauty of Cascade Falls. Yes, that is someone sitting up at the very top of the falls. It is not recommended that people stray off trail, but there were certainly a few on the day we were there. 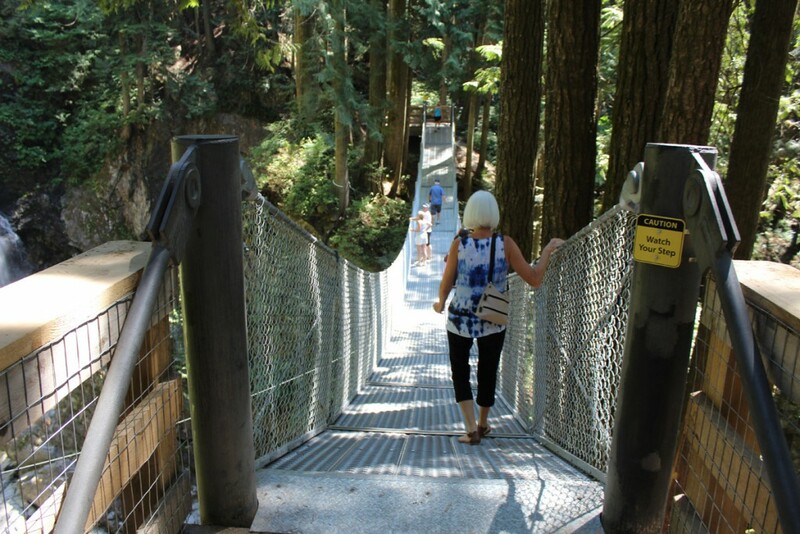 From the viewing platform there is a suspension bridge that takes you over the creek and some additional lower falls which drop another 18 metres. From the other side you get another excellent view of the falls. We were surprised to see a young woman at the very top of the falls standing in the flowing water snapping a picture of some friends. Some daredevils at the top of the falls standing in the swift flowing water. She later waded across to the other side. After watching the young daredevils with bated breath, we wandered in the other direction. We could see additional cascades below and a calm area below that. Additional cascades take the creek down another 18 metres. 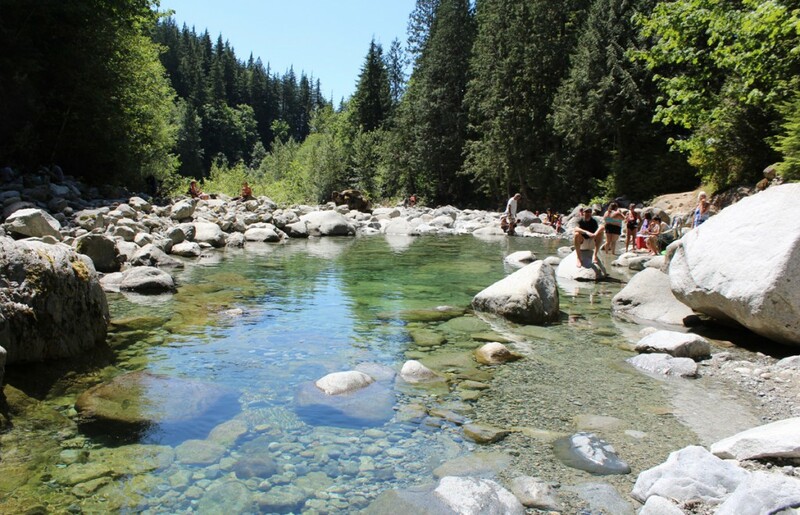 There were a lot of people surrounding the calm lower pools – a great place for a picnic lunch or a cool dip. People wading in the lower pools. The water is clear and refreshing. Looking downstream at the lower pools. 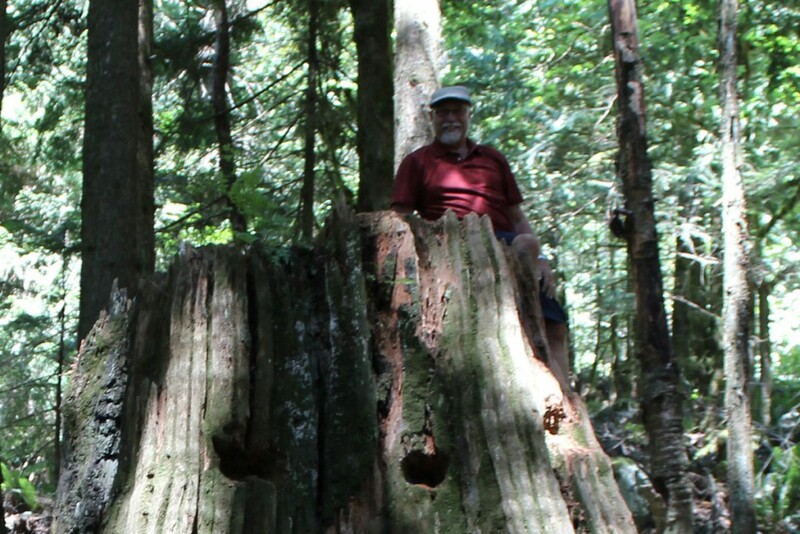 Upon heading along the trail back to the parking lot, we stopped to check out a giant stump. There are a few of them around the park. 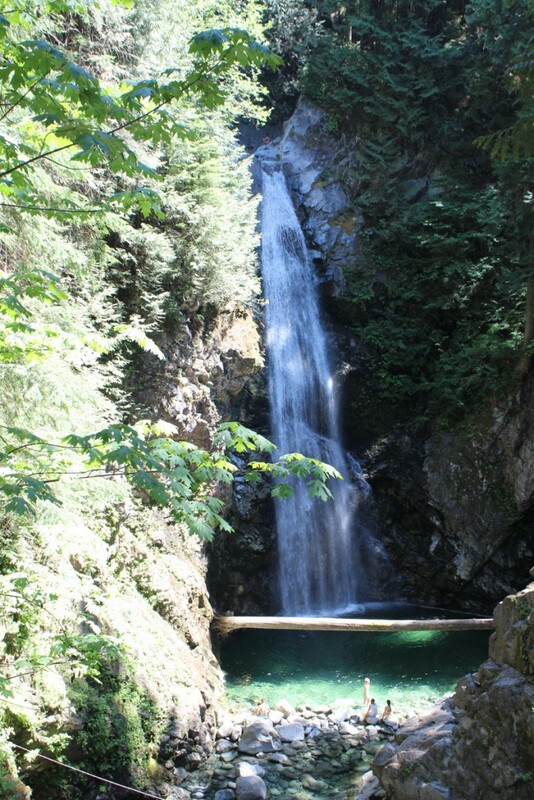 So if you’re a long time Vancouverite looking for something new to explore, take a trip to Cascade Falls. And if you’re just visiting the area, this is one of many nature parks worth exploring. Do check it out! We’ll conclude with a few extra pictures. People enjoying the cool waters of the pool at the base of the falls. 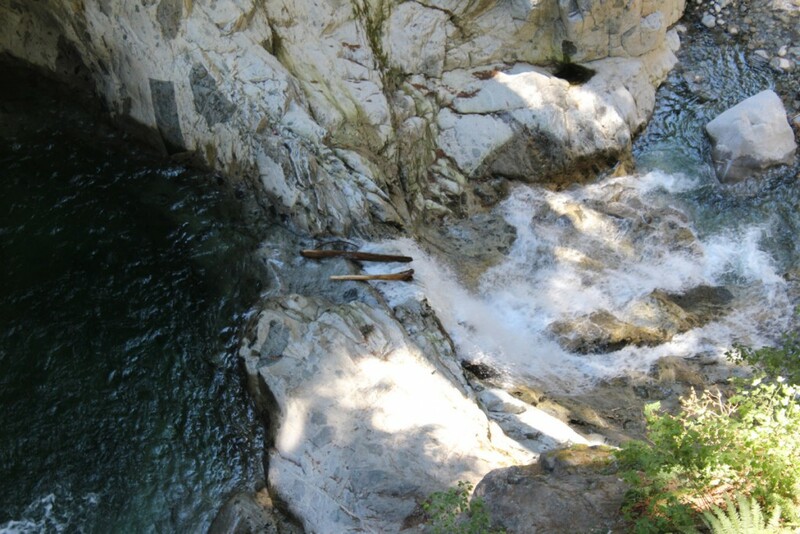 One of the downstream cascades below the main falls. Looking through the trees to the calm pools below.